[ NECKLACE INFO ] 925 Stamped. 5mm Wide. Sizes 20" - 30". Weighs Approx. 2.8 grams per inch. Pure 925 Sterling Silver. Coated with Rhodium Plating for a Long Lasting Shine & Daily Wear Protection. Features a Box Lock Closure for safety and security. 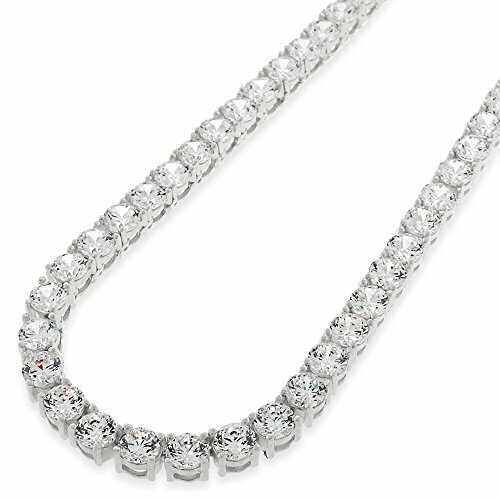 A Smooth Bottom allows for this Luxurious Piece to sit comfortably around your neck. Perfect for Men & Women. Gift Packaging Included - perfect for sending it as a gift! [ BRILLIANT CUT STONES ] A Dazzling Sparkle at first glance. This sterling silver necklace feature an exquisite high polish finish. After receiving yours, you will simply be amazed by the Bright Shine from these Multi-Facet Cubic Zirconia stones. A 4-Prong Setting magnifies the beauty of the stone while safely securing it.